Soyuz T-15 story: "Good bye, Salyut! Hello, Mir!" The text below is my translation of an article published in Novosti Kosmonatiki magazine, issue #8/2011, pages 8-11. This is a big interview of Vladimir Solovyov, taken by NK's reported Alexander Ilyin. Alexander courteously agreed on me translating and posting this interview on terms of preserving his copyright. Good bye, Salyut! Hello, Mir! 25 years ago first interorbital flights between two space stations were done. Manned space ship Soyuz T-15 (Commander Leonid Kizim, Flight Engineer Vladimir Solovyov) was launched on March 13, 1986, and two days after docked to the Core module of Mir space station. The Cosmonauts worked on it till May 5th. On that day, Soyuz T-15 undocked and the next day, May 6th, Leonid Kizim brought it to the docking node of Salyut-7 station. After demothballing the old station and Cosmos-1686 spaceship that was docked to it, the Cosmonauts did few repairs aboard the Salyut, carried out research experiments, few of which they did while on EVA. Having finished their program aboard Salyut-7, the crewmen put on board of Soyuz T-15 containers with experiment artifacts, part of scientific equipment, various station equipment parts, and even a guitar. June 25th, the spaceship undocked from Salyut-7 - Cosmos 1686 complex and on June 26th returned to Mir. The time of flight from Mir to Salyut-7 was 28 hours and 46 minutes, and the back trip was 2 minutes longer: 28 hours and 48 minutes. Since that time, no such trips between two orbital stations in space took place. Expedition of Leonid Kizim and Vladimir Solovyov to the two orbital stations lasted for 125 days. The crew returned to Earth on July 16th, 1986. Once Flight Engineer of Soyuz T-15, and Head of Russian Segment of the International Space Station at present, agreed to tell our reporter about his unique experience. How and why the idea of the interorbital flight emerged? After a premature termination of Vasyutin's expedition in November 1985, Salyut-7 continued its flight with docked module which, in fact, was a Cosmos-1686 spacecraft. On board of this module, optical complex "Pion-K" was installed. It was mainly a laser-aided electronic telescope for high resolution optical observations, which played a role in military space survelliance and rocket defence areas. The new station Mir had been promised to launch as a greeting deed for the 27th Congress of the Communist Party of the Soviet Union, which began on February 25th, 1986, and so it did - the launch commenced on the night between February 19th and 20th. That created a situation which made it necessary to do two things at once: return to Salyut-7 to continue its operation and fly to Mir to activate it and ready for docking of two space freighters. The problem was, that the Core Module of Mir was overweighed, the mass of onboard cabling happened to reach 4500 kg instead of 1500 by the initial estimate. When it eventually came to surface, Valentin Glushko and Yuri Semyonov (who then was a Deputy Chief Designer of NPO Energia) stopped just short of killing the head Designer of Mir Leonid Gorshkov! Konstantin Feoktistov also caught some hell from them. But the problem had to be solved somehow. It was eventually decided to strip everything unnecessary from Mir to make its mass as little as possible, and launch it to a very low initial orbit with expected decay time about 5 to 6 days. That was a terribly short time! But. raising the orbit height with the station's engines worked well, and then subsequent boosting of orbit with Progress' engines followed, combined with first episode of manning the Mir. Our spaceship, by the way, was kind of assembled out of spare parts. Before our flight an accident happened: on September 26th, 1983, a rocket with Soyuz-T ship atop it exploded. Vladimir Titov and Gennady Strekalov were aboard. That was a dark story... The launch pad was burning all the day long then. Me and Lyokha (Leonid Kizim - ed.) were their backups that time. I remember staying in the bunker in the last minutes before the launch. In front of me were Valentin Glushko and Chairman of State Commission Kerim Kerimov, above their heads were openings of ventilation air ducts. Right after the explosion happened we should have switched to closed circuit, but a soldier who sat at controls, confused something and kicked in inflow from outside. And these big air ducts began spewing out soot. I remember watching Glushko, whitish grey-haired, in snow-white shirt and this black soot raining on him. Me and Kizim were at CAPCOM seats at this moment. We screamed: "Emergency, Escape tower, Emergency, Escape, Escape!!!" It seems to me, Titov later said he could recognize my voice at that moment. The escape tower worked as it should, Titov and Strekalov landed safely. And that Soyuz had a leftover part: the Descent Module. That was a most complex part, because making the heat protection shield requires much time and work. So you see, the DM left from the failed launch, and since it was more or less fine, they installed it into our spaceship. Now, it was a strange situation. We had two space stations and only one ship to get there! Feoktistov then produced an idea: let's fly from Mir to Salyut-7 and only after that land. Flying back to Mir wasn't planned in advance. To make such interorbital transfer possible, the Core Module of Mir was launched nearly into the same orbital plane, where Salyut-7 was. Moreover, during spring and summer 1986, height of Mir's orbit was varied in a way preventing misaligning with Salyut's orbit. Twice, the two stations were made not only to sit in the same orbital plane, but also be physically not far from each other: the clearance was kept in magnitude of hundred of kilometres for few days. This was done to make it easy for the Soyuz to travel between two destinations with minimum propellant consumption. Did all the leadership support the idea of the transfer? Or did anybody raise his voice against? Alexey Stanislavovivch Yeliseyev expressed a somehow concerned view on that. He was a very cautious man altogether. One day Glushko called me and asked for an appointment: "Volodechka, could take a trip for my office? We need to talk". Glushko had two notebooks. One was marked with big capital Д (as D for Dear), another bore big handwritten У (as H for Honourable). The "Dear" notebook was for people whom he liked much, to whom sent birthday greetings, and addressed "My dear" in conversation, and the "Honourable" book was for people whom he liked not that much, and whom he addressed "Honourable Mr. smb." I have been on his first notebook list. I went to Valentin Petrovich and he told me the idea of a trip from Mir to Salyut. Then he asked me, "Whom would you go there with? We have two candidates: Kizim and Popov. You have flown much with Kizim, aren't you fed up with him already?" I said I would fly with Kizim, because I knew him well and we were on the same wave. A little bit later, Yeliseyev (who did't know about my conversation with Glushko) called me and told: "Imagine that, Glushko's got an idea of an interorbital trip. Nobody did that! And, by the way, nothing works up there (aboard Salyut-7) anyway. Why should anyone bother getting to that Pion device?" Please, tell our readers more about dockings to Mir and Salyut-7. In that mission, all our dockings were manual. Our Soyuz T-15 had Igla approach guidance system, and Mir only had the response part installed at the aft end, where a place to dock Progress freighters (which were also equipped with Igla) was reserved. That's why we approached the station using Igla at first, then we fell back to manual controls, made a half-circular fly-about and docked from the node compartment end. And in contrast, nothing at all worked at Salyut-7 by our arrival! Many forget this day, that we flew to Salyut using a modified Vladimir Janibekov's and Victor Savinykh's approach, which they first applied during the station's resurrection mission in 1985. That was a ballistic precise guided flight. The ballisticians on the ground counted figures and were driving us into the sphere within 8 kilometres around the station. We then rotated and looked around for the station. When we spotted it, we killed rotation and I took position at the window of the orbital module with laser range meter and began taking distance readings. It was a special "shoot-and-take-reading" device. I shot, marked a time interval, and shot again to get data for speed calculation. Fortunately, I had took care to get a pocket programmable calculator with me. I wrote a very simple program for speed calculation and just pressed buttons during our approach! That was a tremendous advancement! But anyway, at first attempt we've accumulated too many errors, and exceeded speed. Lyokha had to brake like crazy, but we wheezed past the station, and had to come about to get back to the approach course again. Me and Lyokha had a substantial experience of dockings. When we flew to Salyut-7 for the first time (in February 1984), our Igla has failed and we hung unmoving in dark for a half orbit. The ground feared that we would have to abort the docking. When the Sun rose, Lyokha said: "I could have begin docking, but we must wait when communications are re-established." I told him: "Are you waiting for a clearance? I am a representative of Energia and I'm giving you the clearance". And we docked! When a new communication window begun, the ground control asked us melancholically: "So, how are you doing?" And we have already docked by the moment. So we had an experience of dockings. When we flew from Mir to Salyut and back, we got terribly tired. We had to stay awake for more than two days in row, then. Was there another crew who should have gone to Mir? Sasha Serebrov should have to, but his crew raised some concerns in the medics. Those years, doctors were afraid of everything. When we were "screwed into" the crew, after Vasyutin's incident, the medicine people were all but paranoid. We had to visit every medical centre! Well, then, Sasha hid a full Kolos (water supply system canister) of cognac in Mir while it was still on the ground. And he did not say me a thing about it. When we reached the station, I began studying it very thoroughly, as only a true flight engineer could. I was dead sure - such thing had to be somewhere! And there was it - behind a screwed-in panel five litres of excellent Armenian cognac were. In September, 1985, primary and backup crews of the 1st Mir expedition were formed. 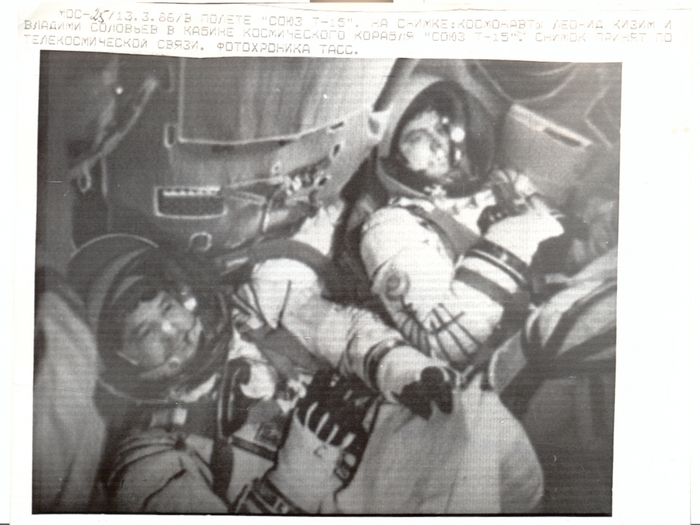 The primary crewmembers were Vladimir Titov and Alexander Serebrov, while the backups were Yuri Romanenko and Musa Manarov. In February 1986, Manarov was replaced by Alexander Laveykin. And shortly before the launch of the expedition, which by the time become the Second Mir Expedition, medics removed flight clearance from Serebrov, and such way Romanenko-Laveykin's crew went. May I ask a utility question, please? What did air aboard Salyut and Mir smell of? Of course, they had different odours. Salyut-7 was a long settled in station, it smelled of kitchen and habitation. In Mir, it mostly smelled of varnish and paint. Please tell us about your scientific program on Salyut-7 and about Cosmos-1686. We were mostly busy with Pion-K device on Cosmos-1686. Through it, I could see with my eyes as people walked on flight decks of American aircraft carriers. Pion automatically compensated for movement in relation to Earth's surface and made the image still. All our observations' results were then used by the military. Working with Pion-K was our primary task: this device’s cost was an insane amount of money. Before launch, we made a special trip to KB Photon in Kazan', because they suspected that one part of the instrument was not rotating. This is what automated tests allowed to tell. Our plans included repairing the instrument a bit during one of our spacewalks. We took our spacesuits to our trip the instrument's developers in Kazan'. With weight compensating attachments we should be training in those spacesuits to repair a Pion. By the way, these training nearly took away a life from one man. A test operator worked in the test chamber before us to confirm the chamber was okay. Somebody on the factory confused the air hoses and filled his suit with Nitrogen instead of air. I remember how we were sitting there in our flight suits, when we heard an alarm and doctors burst running around. And ultimately, no repair was considered necessary in space. The failure was not in Pion itself, that responded like charm to our direct inputs from inside. Only command uplink didn't work. Please tell us about your work during spacewalk, and Mayak truss unfolding. It's interesting that the truss' name was the same as our callsign. But noting worked there! The truss had two drives: manual and remotely controlled electric. At first we tried to unfold it with the electric truss. We tried over and over, but for couldn't make it move. There's a phenomenon of cold welding of metals in vacuum. We also have a device called Yakor' (Russian: an anchor) - that is a thing to support a spacewalker's feet during an EVA. In places where you work, you can stand in such anchor. At Salyut-7, a Yakor' was folded near the hatch. A very powerful spring was supposed to make it open. It was written in the spacewalker's manual: "you open the hatch, approach the Yakor', take care to protect your helmet's visor and pull away the latch" - after that the Yakor' should have folded out. I complied, pulled the lever and anticipated it to open. But it didn't. I tried to push it with both hands, but that was in vain, too. Finally, I stuck my elbow between the station's outer shell and the Yakor', and strained myself to extreme. Only that helped the support platform to unfold. This is how vacuum welding powerful! Because of the same thing, the unfolding system failed on Mayak truss too. I rose above the truss and began stretching it away with my hands, a section after a section. And then we should have activated some very secret military laser device, which was to work against Earth's surface. We were ready to go ahead, but those below did not give us a clearance. What was the purpose for Leonid Kizim to rise on top of the truss? I said him then: "Lyokha, listen up, get on top of the truss; that would be a great shot!" He hesitated a bit: "Won't I get bashed on my bonce for that?" I calmed him down: "You are tethered". I moved back a bit, focused on him from a distance and took that shot. The truss, we then disposed of by pushing the thing away. We didn't care about direction of pushing, as we do now: just sent it flying up, and that was it. I remember zero-g training exercises on Earth. We trained a lot, all the summer long. One of exercises was to teach us pushing of this truss. As usual, there was no certainty, whether we could push it away or not. I was laying down in the plane on my back, wearing a spacesuit, and above me was a dummy truss contained dangling. Weightlessness lasted for only half a minute and during that time I had to push the container - it then slew away on rails. Then it slew back to me, and not only zero-g ended it that moment, but an extra g began when the pilot pulled up from the dive. I got really nervous to see it hanging above my face! When did you get to know about possibility of going back to Mir? How was the back flight going? It was Yeliseyev who appeared on comms and said: "Leonid, your driving is superb. You have enough fuel for an extra trip back". Kizim put off his garniture and exclaimed: "Strike me pink! Nobody said that on the ground, but instead everyone seemed to hate the idea. Hey, Grayhair (he called me like that ever since our first acquaintance, when there was not a trace of grey in my hair yet), do you feel a smell of it?" I said: "Yes, I do - we are flying back to Mir." He snapped: "Not just that! Our mission is extended, quite a bit! We've got to do thousand things here." We ripped many things from Salyut-7 before our departure. There was a local tradition to sign a wall panel with a soft tip pen. So I "committed a crime": I cut out the entire panel with everyone's signatures and took that thing with me. Later, I gave pieces of that panel to all signers, first having them stamped over with Salyut-7's insignia. After finishing work on Salyut-7 we could not undock for a long time, because command sequence could not pass. We tried about thirty times and we even have got ready to fire on Ground Control's mark the explosive bolts attaching the docking node to our ship. Eventually, one next command had effect, and we separated. The Salyut was damp and cold. Its wire network was rotting, and this made electric signals "wander" on their way. The station could not work as intended, anymore. Valentin Petrovich had an idea to use a Buran to land Salyut-7 on Earth sometimes for study of space exposure effects on materials. To make it possible, the stack of Salyut-7 and Cosmos-1686 was boosted into a higher orbit. Who could know it would fell down so soon?! And Buran program would die not long thereafter. There was also an idea to fly to Salyut-7 once more, to take samples of cable, to cut out sockets to boost study of process of hardware aging. But that also didn't come to reality. And we carried with us all we could take. On the way back to Mir I slept in the Descent Module, and Lyokha engaged the Orbital Module, because he liked to stretch his legs. After we filled the ship with items from Salyut, there was a very little space left in the Orbital Module, only a narrow crawl-through passage between two hatches remained clear. Lyokha slept right there, with feet near the docking hatch and head near the inter-module hatch. During our travel to Mir we had one very nasty abnormality. An alarm sounded and "Failure of automatic descent system" light flashed on. The worst thing was that this system was connected to electric air pressure equalizing valves in the cabin. It was possible that a command opening valves Dyh.1 and Dyh.2 could be accidentally issued, and exactly due to accidental opening of these in space crew of Soyuz 11 died. When this alarm "yelled", we got startled a bit. To make things worse, we did not completely don our spacesuits: our legs were in trousers, but upper parts weren't properly laced up. Moreover, the intermodule hatch we kept open even during dockings, and, since we were short of carbon-dioxide absorbents, we used these put in the OM to save the absorbents from the DM for a later use. By contemporary standard, this would be a grave safety violation! The trip from Salyut to Mir was easier, because the long distance approach we did with help of Igla, and only switched to manual at a close range. What impression do you have left from Cosmos-1686? Inside was a stockpile of medicine. Before us Vladimir Vasyutin was there, and apparently, it was his personal reserve. I had to sort these things away, and while I was doing that, Lyokha told me: "Hey, you are young and I'm already old. If you find anything with ginseng, hold it over for me!" Medicine there was mostly specifically "Vasyutin's", and I had to consult with Colonel of Medical Service Anatoly Dmitrievich Yegorov from Institute of Bio-Medical Problens over a half-secret line so that he told me what to keep. He helped me to decide what to keep and what to throw away. The "to keep" list included mostly vitamins and tonics. An idea emerged to carry these things to Mir, because absolutely nothing was there. By the way, that TKS was really huge inside, and was able to keep a lot of stuff. There was even honey in honeycombs there! The TKS ship was very big and felt like a combat vehicle inside. Like interior of a fighter differs from a passenger plane's, the TKS did. Even the wall painting colour was different. When we first opened the hatched and came inside, Lyokha exclaimed: "Wow, this is a fighter's cockpit!" Also it had a big window, through which we could photograph the upper part of Salyut-7 with solar arrays. It was beautiful, especially in bright sunlight. Could you compare three stations: Salyut-7, Mir, and the ISS? Today we have grown past routine operations. For example, on Salyut-7, there was a form we filled out with info on every communication session. We had only few ground stations to make contact with and could do that only on specific orbits. We have not been dreaming of a global comm satellite coverage then. I have kept a notebook in which I written down times for comm windows: 10:37, 10:51... In these times, I had to activate all things: VHF transmitter, VHF receiver, all things like during the WWII. If you missed the time, ground control would send you a call for conversation, an alarm would sound. Now, there are no things like that. One more things, at Salyut-7, to make a proper partial pressure in the breathing mixture, you had to take readings of gas analyzer and open oxygen valve yourself. Now automatics take care of all these things. When we first came to Mir. it had a miserable radio equipment, too. Then. first Progress arrived and with it modules of satellite communications came. The comm satellite to provide link for the station, called Luch, was already launched. We installed these blocks and tuned satellite comms. And finally, we reached a success. When April 12th came, a huge public TV screen was installed on Kalininsky Avenue (that's called Novy Arbat today). It was only such screen in Moscow these years. On April 12th, transmission from Mir was put on this screen! TV engineers gathered a crowd, and people asked us questions. Me and Lyokha sat like tied down. We had to do lot of things there, and this stupid satellite made 45 minutes long transmissions possible! That was a big leap ahead as compared to 10-15 minutes of uninterrupted conversation ground stations could provide. Lykha even asked me, when would that end? Today we have a permanent contact with the ISS' crew. At present, only American satellites make it possible, but soon we'll restore our own means. One more difference: only we and nothing else controlled the national space stations (Salyuts and Mir). And these days, we have two communication loops. One involves keeping link between all the ground controls and another is between ground control centres and the station. It is a very different control scheme, which we call distributed. One much more complex than on stations before the ISS. And one important thing: old spacecraft had a completely analogue attitude control, such a crude thing. The precision would make a lumberjack proud. Today we are accustomed to attitude errors in magnitude of angular minutes, and then a station would sway aside so much that error of about five degrees was noticeable with unaided eye. Was a similar flight from Mir to the ISS possible? In reality, we asked for that, but the Americans turned us down. Yuri Koptev chose not to insist. We had to be careful with those whom we expected to be long time partners and generally, rescuers of Russian spaceflight. Those, who helped us out of a grave situation. What did we have in 1992? Except for many ideas, capabilities, and Mir in orbit, nothing. Our financing dropped 20 times in one moment. And we still had to finish construction of Mir and fly there. So Koptev and Semyonov had to depart on a business trip. First they travelled across Europe, they have been promised lot of things there. Later, I can remember, they tried to make a deal with Japan. And as last resort, they appealed to the Americans, asking money in exchange for ideas. This way, the manned space was pulled from a deadly dive, and with it the rest of Russian spaceflight industry. We drew the delay before launching SM Zvezda for too long already, and to align the planes with Mir by precession, another 6 month of waiting were required. But the Americans didn't want to wait. But had them did, it would certainly be possible to transfer equipment from Mir to the ISS, like we did during our mission. If orbital planes are aligned, everything is possible. The phase angle does not matter - we can cover phase of 360 degrees if we want. Leonid Kizim and Vladimir Solovyov returned to Earth on July 16th, 1986. Their 125 days long flight did not set a duration record, but its uniqueness is unsurpassed till the present day. Now that's quite the story. Quite a read. I liked it. One of the most fascinating LEO missions, great read. An interesting look into both this interesting mission and Soviet/Russian spaceflight. Surely yes, why not? But please make a copy of the article there, don't delete the thread. upd: Wow, this is my post #4000! Thanks, ST! That was a great read. Maybe in a few years when some commercial stations are on-orbit, we could see some trips between stations once again. Thanks, this article is a great read! Had no idea it even happened. We need a scenario for this flight - any volunteers? The scenario uploaded OH doesn't appear to be there anymore but the one attached shouldn't be too hard to fix. I'd suggest changing it up to use the historical Soyuz add-on. Last edited by Tacolev; 09-08-2011 at 01:22 AM. Awesome reading, thanks for posting this.